The London 2012 Paralympics haven’t started yet but the competition is already underway in Westminster. That’s despite the fact that most politicians have left their Westminster seats for a few months holiday, well away from the madding crowds in London. But London Mayor Boris Johnson and the Prime Minister were back in London this week to launch the London 2012 Paralympics with a short ceremony in Trafalgar Square. And some Paralympics speeches. There’s a keen sense of competition between the two. That’s no surprise given their respective jobs and the fact that the London Mayor has the highest personal vote of any elected Tory politician in the country. That’s the UK electoral system for you. Their sparring yesterday took the form of a photo-shoot and their respective Paralympics speeches. They have their own recognisably distinct style of public speaking. Boris Johnson speeches are direct and flamboyant…and carry a sense that he could run away on a tangent at any time. David Cameron speeches brim with rhetorical devices and art…and appear controlled at all times. Yesterday’s speeches at the launch of the London Paralympics were no exception. His speech oozed fun and jollity. He received a huge cheer at its start and continued to get the laughs and cheers as he continued with the short speech delivered with notes. This is a favourite form of speech for the Mayor. And is, of course, quite unlike the Boris Johnson HS2 speech in January 2012. It was obvious that his Paralympics speech had been researched using either Google or the BBC’s “On This Day” page. But it worked. In contrast to his assumed competitor, the Prime Minister David Cameron received a smaller cheer before his speech at the lighting of the Paralympics cauldron. Even he noticed it and grimaced. His speech oozed class and style which was expected. His audience was treated to a range of rhetorical devices and techniques…that were probably lost given all the excitement. 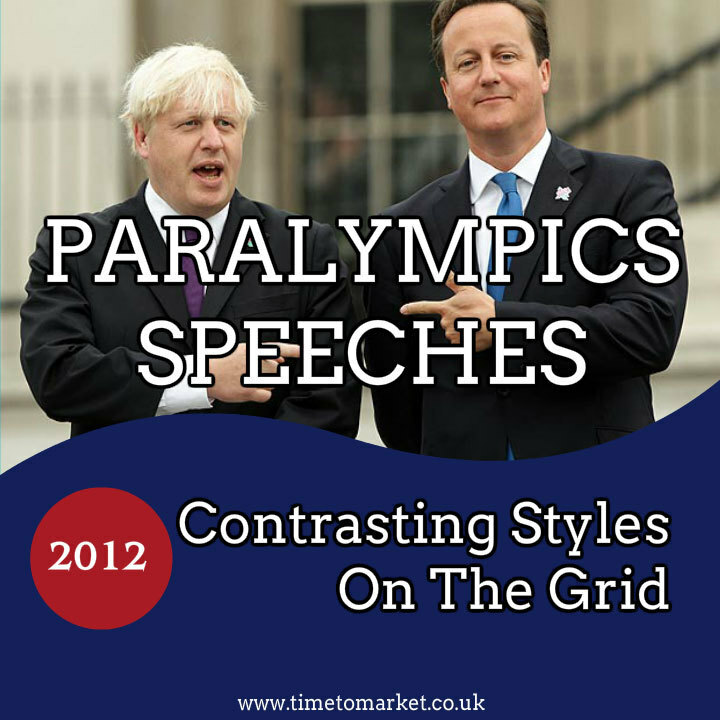 Two fine speeches of contrasting style to start the Paralympics. When you need more help to get your speeches alight, you can always turn to our series of public speaking tips. And, of course, when you are ready for more tips and suggestions you can always opt for a public speaking course or a public speaking coaching session. Please don’t hesitate to get in touch when the time is right.